UTorrent is a download manager for Windows, Mac, Linux and Android, more sought after by users from around the world. The program, which uses the BitTorrent protocol is lightweight and offers great features such as RSS reader and possibility to install other apps in the software itself. Despite having many features, its popularity among users is related to one main feature: high transfer rates. Enjoy uTorrent to download now! Downloading and installing the software is very convenient and fast. Just download the installer, which has only 722 Kb, on this page and start the installation. After installing, the user can download the desired torrent on sites like The Pirate Bay or YouTorrent files. However, it is best to pay attention during installation, because the program adds a toolbar in your web browser and defines how new homepage. So if the user does not want to install, you must uncheck the option during the process. "Super fast. Very light ". This sentence makes clear the intention of the uTorrent: be a lightweight software and at the same time, able to provide maximum resources so that users can make downloads quickly. One of the advantages of the application is certainly his size. With less than 1 MB (size less than much of the digital photos today), it requires very little system and has a much faster installation than the average software. Practicality is not just the installation. All the features were designed to facilitate the user's life. Thanks to this, with just a few clicks the program is ready for use, and thus it is possible to locate the files and start downloading quickly. You can download movies, programs and games in a very simple way with the application. First, the user must locate and download the required for your computer and there are two ways to do this torrent file. It can be downloaded by the browser or uTorrent, then, on sites that provide this type of content, eg, the Bit Che, Torrentz, Mininova, The Pirate Bay, TorrentDay, among others own. However, many of these sites offer content that is protected by copyright. Thus, it is illegal to share these files considered "pirates". So, an interesting option is to search content on the site ClearBits. In it, there are only documents or open source licensed under Creative Common. Once you download the extension for Torrent file, you must start it with uTorrent program. Just click on "File" and then "add torrent". The user can also double click on the downloaded software to the open file. After it starts, you must select the location where the download will be done on your machine and click "ok". View a complete guide on how to use uTorrent. There is nothing more frustrating than waiting hours for a download order and find that the downloaded file was not expected. To avoid this, the platform provides a facility for viewing the streaming downloads before they are completed. A great way to avoid unpleasant surprises. Despite having great features, all features are arranged in a practical and intuitive way. Logo to open the program, the user already view the main menus at the top, as well as search fields, buttons for download management and two views. To improve utilization and match resources to the needs of each user, you can customize the items to be displayed, or use the concealment of resources. Thus, there is the possibility of identifying the functions that uses more and organize them according to your preference. To begin installing the service, the user can set it to be translated into Portuguese. After choosing the "Portuguese (Brazil)" option in a short time, it downloads required to install the software in Portuguese. Gone is the time when downloading a song took forever. Nowadays, many users already have Internet with speeds above 10 Mb, enabling the realization of multiple simultaneous downloads. Besides allowing the set according to the capacity of the internet, uTorrent has many features to allow the user to manage and organize your downloads any way you want. You can still modify the status bar by adding or removing information about the downloads. If you wish, you can control some options for individual downloads. There is the availability of limiting the throughput of some files, prioritizing download the file you want to finish first. Learn how to download files faster in uTorrent. To facilitate the first contact, a Setup Assistant is available to assist the user. With it, you can adjust the operating capacity of its internet and its usage profile. After the first steps, the service is now ready for download, but each user can configure it according to your profile. You can configure almost everything from general options, such as language, to advanced connection settings. The system of evaluation and feedback is another benefit to the user community. With it, one can see the average of the ratings given to a file and the reviews posted by other users who have downloaded it wanted. When performing a download, you can give your contribution and evaluation or the downloaded file. Besides helping other users, this system also contributes to the reliable sources are prioritized and unwanted content to be more easily identified. If the person already has the habit of using feeds, no way to bring this habit also for uTorrent. When you add a feed to the program list, you can monitor the activities of specific torrent sites and, if desired, set up automatic downloading of new content, according to the defined filters. Remote access is a resource for those who dislike unglue your downloads even when away from home. Thanks to this functionality, you can monitor the transfer and access to the main management options download, even from a distance. The uTorrent Remote tool can be accessed by any web browser, or through the application for Android devices. Following the trend of using extensions, software created a central application with several options divided into three categories: video, audio and podcast. 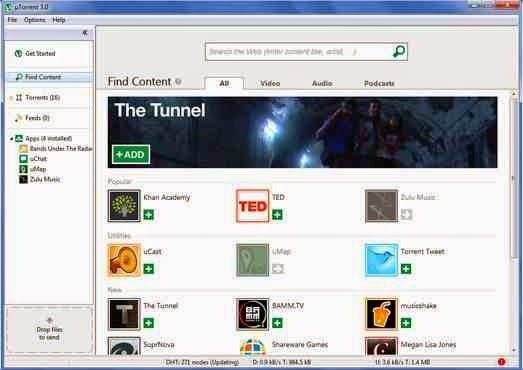 Through the feature, each user may search for new features for the torrent client. This is another option for those who like to customize programs and make the most of their resources. The system works with the apps already showcases traditional applications for smartphones and browsers. Just pick from the various options available (games, tools, music etc) and enjoy. There are even apps for integration with major social networks of the moment. The option to stream content is very practical. With it, there is now functionality to directly see the program content of audio and video files. Simply tap the green icon with a symbol of "Play" for the file to be played directly without the need to wait for download to finish. Magnetic links are a new way of distributing torrent file. The magnetic link, the connection between the computer you want to download the file and the PC that has the file is done directly. Previously, they were required servers with trackers (trackers), but now everything is stored in DHT (Distributed Hash Tables). Works as follows: the link there is a small "piece" of the final file serving for identification. To possess it, uTorrent can identify who is with the other "pieces" and if these appear in the new network, it tries to download them to complete the download. Sounds complicated, but for the end user, nothing changes, Torrents remain the same and magnetic links do not affect the download speed and upload. The portable version is as light as the original version and has all of its features. The big advantage is that, instead of installing the program on your computer, you can load it and run it directly from a flash drive or other USB storage device. With the arrival of uTorrent for mobile devices become even more convenient to download videos, music, books and any other file type on tablets and smartphones. "All torrents", "Completed" and "Downloading" form the list of resources in the application. In the first, the user can view all selected torrents. There are files in the download process, waiting and already acquired. In "Completed", the app only displays the list of existing content on the device, which greatly facilitates the visualization and organize your music. Finally, "Downloding" shows, in turn, which is still in the transfer process. The app for Android is faster if you use a wi-fi connection. Additionally, piggyback on some other connection saves your data package. The service allows you to play a song or video you just downloaded. In addition, there are also options to pause a download, if you need to leave the area wi-fi coverage, and another button to resume it. Thus, no download is lost. The application for smatphones is in beta and can show improvement. Download the uTorrent to download files from Internet with quality and much faster!